Interested in a Custom Wedding Cake? We Can Help! Island Sands Beach Weddings works with the very Best Cake Designers in our area! 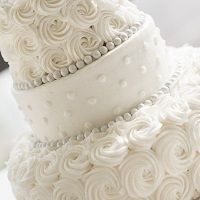 Just let your Coordinator know what you are interested in and once you are booked with us, we will work with you to help you choose your Perfect Wedding or Grooms Cake. If you know what kind of cake you would like take a look at the information below and once you are booked with us we will work up a quote for you. Just let us know the flavor cake you would like, the style you are going for, how many it needs to feed and if you would like to keep the top layer for your anniversary. If you have any pictures that would be very helpful also. Below are some options for you to look over. The price will also include local delivery and set up. A tasting/consultation can be arranged by appointment. While we try to accommodate schedules, we generally take appointments during business hours Monday thru Friday.